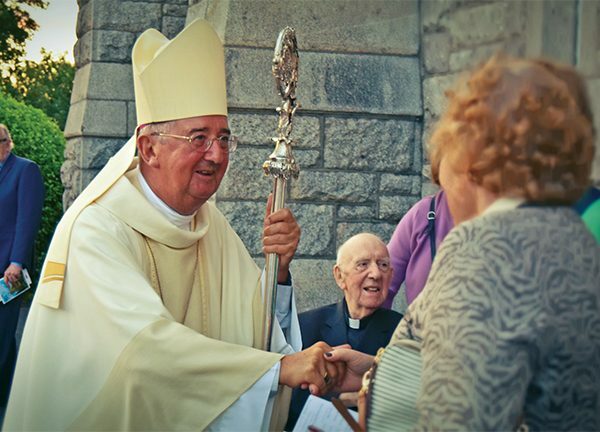 A commemorative mass was held on August 26th in the Church of the Sacred Heart, Donnybrook with Archbishop Diarmuid Martin as chief celebrant. It was well attended and included Dublin’s Lord Mayor as well as many former priests associated with the area. There seemed to be a spirit of regeneration and an emphasis on calling the faithful to be more evangelical, to build on this moment and to create moments in the community, such that younger people would either find or become part of the faith for future generations. Although the audience itself was made up principally of senior members of the parish, there were many younger people there too. The Archbishop, although a very learned man, was still able to make jokes about “googling” history. However, for all his niceties and his politeness, there was a determination to win over the crowd to a message he has obviously carried “with him and within him” for a very long time. He emphasised Pope Francis’s commitment to the “people on the margins” of society as being as important to hear the Christian message. There was a generally conciliatory tone, which we have come to expect from the Primate of Ireland. However, this was mixed with a forthright emphasis on an “intellectual engagement in faith.” There was also a call towards action with the theme: “How can I best contribute to my Irish faith”. This was a welcome note from one of the most respected church figures of recent times. As regards the historical significance, a brief history of the founding of the church was discussed by John Holohan, a local amateur historian, with an enviable knowledge of local history. He spoke of the grant for the church to be built and in working with the Church of Ireland’s archbishop of the time. Archbishop Martin emphasised that the charity of the inhabitants of Donnybrook at the time spoke to the commitment “and faith of people from the mid 18th century,” which was “a time of revival” for Catholicism. All in all, the ceremony was moving and provoked the listeners to call into question the “historicity” of religion, of community and how that had developed into the events today surrounding this weekend’s commemoration of the 150th anniversary of the Church of the Sacred Heart.